BRUSSELS, Belgium -- A top EU official said on April 7 that Ukraine could wrap up its Association Agreement talks with the European Union within the next six to 12 months. But Hugues Mingarelli, director-general for external relations at the European Commission, also hinted at potential difficulties. He noted that Ukraine's new administration under President Viktor Yanukovych has yet to show its true colors, while the EU itself is split on some of the key issues, and some of Ukraine's "neighbors" -- code for Russia -- are actively working to steer the country away from integration with the EU. In a nutshell, Mingarelli told the European Parliament's Foreign Affairs Committee in Brussels that Kyiv finds itself at a crossroads. If all goes well, Ukraine could within a year's time become the EU's first eastern neighbor to sign an association accord with the bloc. The treaty could turn into a springboard to membership should the EU opt for another round of enlargement. "If the Ukrainian side remains engaged the way it has done over the past three years, we hope negotiations can be concluded in the course of the next 12 months," Mingarelli said. Or Ukraine could find itself in political and economic limbo having to perform a paralyzing balancing act between the EU and Russia. Much, Mingarelli said, will depend on Kyiv itself. Mingarelli reiterated the EU's satisfaction that newly inaugurated President Yanukovych chose Brussels as his first foreign destination on March 1. Yanukovych "said everything we expected him to say," the EU official said, describing the atmosphere of the visit. EU integration and signing an Association Agreement with the bloc remain "top priorities," Yanukovych told the EU. Brussels is also pleased with the selection of "known and skilled figures" as deputy prime ministers in charge of EU integration. But, Mingarelli noted, Yanukovych's new team has yet to act on its promises. He said the Association Agreement negotiations, launched in spring 2007, slowed down last year due to the conflicting interests of "some of the oligarchs." Customs tariffs and duties are a key sticking point in free-trade talks -- technically the most demanding area of the agreement. There is also some disagreement on the political side of the talks, Mingarelli said. "In the political dialogue, there are three unresolved points," he said. "First, there is the Ukrainian request for a prospect of accession [to the EU]. Second, there is the Ukrainian request for the free movement [of people] at an early date -- the EU proposes, for the moment, to view visa-free [travel] as a long-term goal. And there's the debate concerning the wording of [articles in the Association Agreement] relative to the territorial integrity and sovereignty of this partner country." Some of the issues are relatively straightforward, Mingarelli said. For example, "Ukraine must understand the EU is in no position to ensure the security of any of its international partners," he said. On others, the EU itself must first make up its mind. An accession prospect for Ukraine -- in whatever form -- will not materialize before all of the bloc's 27 member states agree. The EU is also split over visa-free travel for Ukrainians -- Kyiv's most realistic hope of a significant concession. Ukraine has asked for a "road map" clearly and exhaustively setting out all EU preconditions. 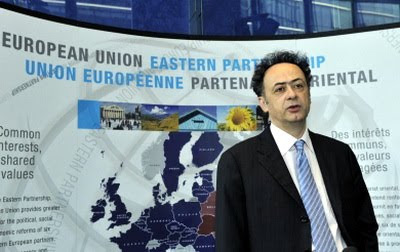 But a number of EU member states fear that giving Kyiv a "road map" would mean binding the bloc's hands, making movement toward the abolition of visas an "automatic process" -- as it has become in the western Balkans, Mingarelli said. Instead, these EU countries would like to retain what he described as their "political discretion." But Mingarelli also gave evidence of a growing sense of urgency in Brussels. He said there is a realization that outside forces are increasingly at play. Among a number of "worrying elements," Mingarelli listed pressure on Ukraine to join a customs union with Russia, Kazakhstan, and Belarus -- which would preclude free trade with the EU. Another EU concern, he said, is talks now under way between Moscow and Kyiv to give the Russian gas monopoly Gazprom a role in managing Ukraine's gas-transit system. "Ukraine does not exist in a vacuum," Mingarelli said, summing up Ukraine's choices. "There are forces which are not pushing Ukraine in the direction of the EU."